Lawn signs. We see them everywhere. In front of buildings, driving through suburban neighborhoods, and even at your local parks. Lawn signs are a great way to establish name recognition in your area. Whether it’s for a political campaign or you are advertising for your small business, lawn signs will get your name out there in a big way. No matter what is going on, lawn signs will bring in a lot of people, especially if they are just walking or driving by. If they didn’t work as an effective marketing strategy, people would stop buying them. The truth is, thousands are purchased weekly because they are so effective at getting your message out. According to The Measurement Standard, every lawn sign you put up represents 6-10 new potential votes for a candidate or customers for a small business. When thousands of signs are put up, that impact is huge. Not only that, but if a candidate or small business can get someone to start putting up lawn signs for them, that person is not only more committed and loyal to that candidate or small business, but they also encourage friends, neighbors, and co-workers to vote for that candidate or visit that business. Lawn signs are a powerful force in the marketing worlds. With every lawn sign put up, they not only have to have an appealing message, but they also have to look great. Stand out from the crowd with these tips. You won’t see lawn signs made from your standard construction paper. These signs have to be light and weather resistant. Most signs you see today are made of 4mm corrugated plastic. This material is light and comes as an inexpensive flat rigid sheet. They will deliver the longevity and durability your sign needs without compromising quality. They are also waterproof, weather resistant, and stain resistant. Another popular material is a 13-14oz vinyl banner. They are great for lawn signs and as banners to hang from a fence or deck. Designs can be printed on one side for vinyl or on both for corrugated plastic. Both materials have a semi-gloss finish to truly make the colors of your prints pot and shine. Speaking of color, you can your sign to be noticed by the public, right? It is vital that you create them with vivid, bold colors. Think about color combinations that will pop. Using a red background with yellow text, for instance, is a high-contrast combination that will get noticed. If you are worried about something clashing with your logo colors, try a statement color with a white background. While contrasting colors are good in moderation, it is best to avoid bad color combinations. These include yellow text on a white background, red letting with brown or anything where the text does not stand out or is unreadable. These will not get the attention you think it will get, coming off as unprofessional or unreadable. If your lawn sign doesn’t get noticed, or it is thought of as tacky, it will not bring you any business or potential voters. One of the biggest mistake people make is using a sign that is too small. The general rule is that your sign letters need to be 1 inch tall for every meter/yard of distance the sign is commonly viewed from. Most people won’t stop as they pass your sign, so you need to get their attention quickly and keep your business or political campaign fresh in their minds. Your sign should be no smaller than 11″ x 17″. Most city jurisdictions will allow signs up to 4 square feet, so use as much space as you can. Match the word size to the sign. Small words on a big poster will be drowned out by white space or too many designs. If words are too big, they risk looking squished together or broken apart on different lines. When choosing a color, the more contrast between the words and the background, the better. Also, steer clear of fancy fonts. They can be hard to read and people won’t take the time to try and decipher it. When placing your sign, be aware of local laws and ordinances. Be aware if your city has a limit on the number or size that is allowable. Choose locations where potential customers or voters passing by can see your lawn sign for more than 5 seconds. Place them in high traffic areas whenever possible. If they are on a residential lawn, inform the homeowner that once the sign is up, it needs to stay up. If any foul weather, curious animals or nosey children try to tear your sign down, it is best to put it back up as soon as possible. That being said, moving your lawn signs is an effective way to make them more noticeable. Towards the end of your campaign, try moving your sign or adding balloons or ribbons to them to attract the wandering eye. A good rule of thumb is to place your signs every 1 mile or so. This is probably the most important part of your lawn sign campaign. A strong call to action is a vital part of any marketing strategy. Keep everything uncluttered and to the point. If you are getting the word out about a candidate, consider placing a headshot on your lawn signs. Having a face to go with a name goes a long way with keeping that name in the minds of potential voters. Also consider putting website addresses, social media handles, and addresses on your signs as well. Phrase things simply and make sure all the important information is there. Don’t worry about trying to be clever or funny as this can be distracting and sloppy. As long as all your information is on there, your sign will be effective. At New York Marketing we have experienced graphic designers on-hand to create personalized print advertising to fit your company’s needs. Combine text, graphics, and images to convey a strong message and build brand awareness. 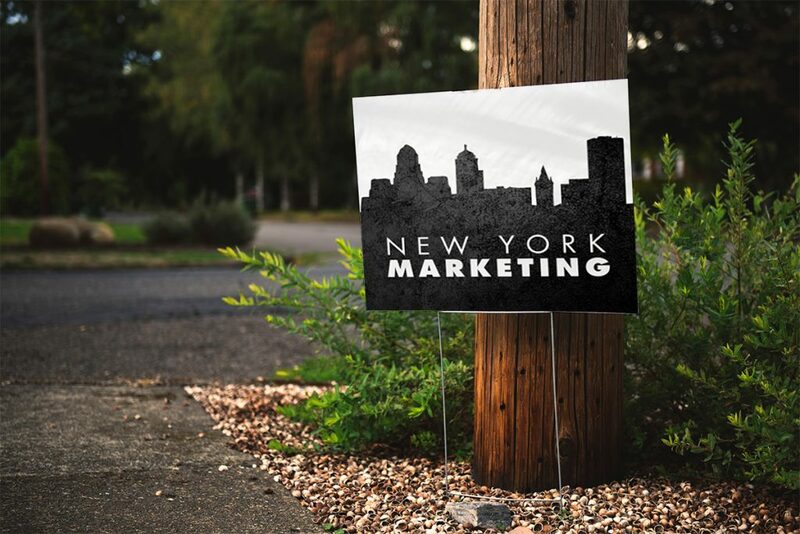 Target consumers directly with eye-catching lawn signs for your candidate or small business. A Giant Thank You From New York Marketing!